Outlaw The Democrats: We don't have a gun problem, we have a Socialism problem. We don't have a gun problem, we have a Socialism problem. Given the tragic events at Parkland High School in Florida today, you no doubt have heard scores of people on TV and the internet blaming guns for the tragedy. That is Nicholas Cruz. 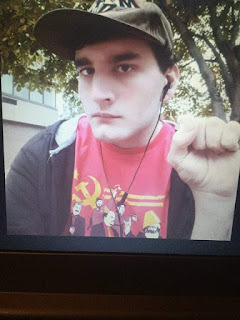 Wearing a T-shirt that is glorifying Communism, and giving the "Resist" hand gesture. ...the pattern is too pervasive to be ignored. This is not a gun issue--we've had guns in our nation since day one, and far more access to them in the past than we have today. It's not even a question of the "evil" AR-15 "Assault Rifle"--America has had semi-automatic rifles for most of the 20th Century, and semi-automatic handguns for far longer than that...but only recently have we had the problems with mass shootings and violence. Let's stop scapegoating the very tools that good, law-abiding Americans need to defend themselves from scumbags like this. Instead, let us be adult enough and sober enough to realize the true cause--it is Liberalism, Socialism, Communism. Whatever "ism" is your preferred term, they are literally trying to destroy America and kill any and all of us who love this nation and this country. It is time to institutionalize or incarcerate every last Democrat, Liberal, and Socialist in America.